Dr Weasel and I spent this week’s Bank Holiday Monday in Stamford, where we had our wedding reception in 2004. 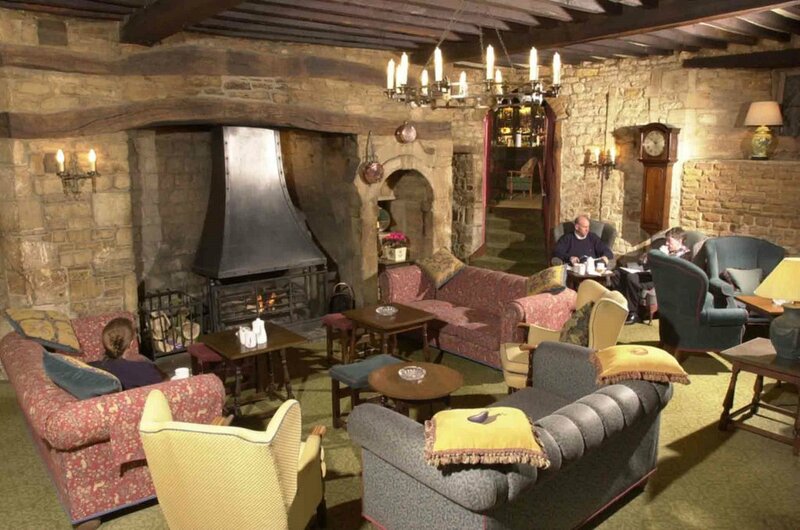 The George Hotel is one of my favourite places in the country: it’s a coaching inn that’s been active since around 947 AD, with a gorgeously planted garden, quiet lounges with inglenook fireplaces, comfortable rooms and two very good restaurants. It’s in Stamford, a beautiful market town built out of creamy Barnack stone, a few minutes from Burghley House, the palace built by Elizabeth I’s treasurer, William Cecil. We spent the morning at Burghley, then stopped at the George for the afternoon to have tea and scones by the fireplace, and read our books. The hotel is probably the oldest still functioning in the UK. 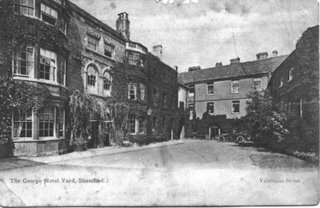 The original coaching inn forms the heart of the building, with the two religious buildings on either side incorporated into the inn about 500 years ago. One side used to be the Holy Sepulchre, a hospital of the Knights of St. John of Jerusalem. The George’s historical success came from its position at the side of the old Great North Road, and pilgrims and knights of the Holy Sepulchre stopped here as they travelled from the north down this main conduit on their journey to Jerusalem. There is a crypt beneath the cocktail bar where you can see part of the old hospital, and little architectural details pop out all over the building; trefoils carved in the stone, medieval gateways and the thick walls which once formed the outside of the building, now inside the hotel. We ate yesterday’s meal in the Garden Lounge, where the menu is a bit lighter. The menu changes seasonally, but there are a few constants – the gruyere fritters with a Thai chilli jam have been on the menu since I can remember. I had this gorgeous Brittany Platter – a dressed crab, a langoustine, an oyster (only one, sadly), a clutch of whelks, little palourde clams, cockles, mussels, tiny pink prawns and a huge king prawn. The enormous platter was served with a green salad spiked with celery, home-baked bread, and three home-made mayonnaise sauces; a Marie Rose, a mayonnaise tout simple and an astonishingly good tartare sauce. The seafood here is always good; this was gloriously fresh. The shellfish, steamed gently, tasted of the sea, and the prawns were sweet and tender. It’s always good to find a whelk that’s not gritty or slimy, and these whelks accomplished that with aplomb. Grated egg yolk and white garnished the crab, and my, those little clams were a thing of beauty. Remarkably, I nearly managed to finish this; I left about five prawns, a couple of mussels, a whelk and some of the crab’s brown meat. Nearly 24 hours have passed, and I’m still full. If you’re in the UK and looking for a weekend away, or if you’re visiting England from abroad, do think about spending a couple of days at the George. There’s nowhere I know that serves up that mixture of tradition, service and comfort quite as well. Ask for the kippers as part of your enormous breakfast, and tell them I sent you. Alert readers will have gathered that I am currently drowning in tomatoes, and that yesterday’s promised recipe for the other half of a packet of puff pastry was bound to include them. You’re right – today it’s tomato tart. If, as a friend I was talking to tonight does, you have a vegetarian to entertain, you’ll find this little tart really pretty, delicious and very quick and easy to prepare. I found this goat’s cheese (Picolive) something of a blessing; my original plan had been to stir a teaspoon of tapenade into the cheese, but this came with olive paste already sandwiched in the cheese. I bought two; it’s a very nice little cheese, and I’d like some for lunch on some crusty bread. Score a centimetre from each edge of the pastry rectangle to form a crusty border which will puff up when you cook it. Use a fork to prick holes in the inner rectangle so it doesn’t rise. Mix the tapenade and two grated cloves of garlic with the goat’s cheese, and spread it on the inner rectangle of pastry. Slice the tomatoes and arrange them in overlapping layers on top of the cheese. Top with the rosemary, season and bake at 200° C for 20-25 minutes, until brown and puffy. The tomatoes will be sweet and juicy, the cheese toothsome and the pastry crisp. It’s almost enough to make you swear off meat. When I lived in London, I worked a few doors away from Antonio Carluccio’s Covent Garden delicatessen and restaurant. Between that delicatessen and the MAC cosmetics shop, I usually managed to relieve myself of most of my salary by the end of the month with astonishing ease. It is depressing to realise that all you’ve got to show for having edited half a book is four tubes of pink-coloured whale fat, a pot of something sparkly, a small bag of pine nuts and a stomach full of aubergines that somebody else has cooked. Happy day. I now live in a house which is essentially in the middle of a field, four miles from the nearest shop. I work from home these days, being a freelance, so I’m not tempted to don wellies and hike out to the shops in my lunch hour. This means that I make my own caponata and get to spend more on sparkly things at the weekends. Caponata is a Sicilian vegetable dish, and it’s brilliantly flexible; you can use it as a side dish, a salad, a kind of saucy base for cooked meat; it is good hot, cold from the fridge or (my favourite) at room temperature. It’s typical of Sicily in its Arab-influenced agrodolce, or sour/sweet flavouring, and is spiked with savoury olives, capers and pine nuts. This is very similar to the caponata from Carluccio’s (which they used to serve in a gorgeously oily foccacia sandwich with a slice of Fontina cheese). It’s another good recipe for those with a glut of tomatoes – I used a sugo (tomato puree) I’d cooked and bottled last year. Those without their own can buy good sugo at an Italian delicatessen (I recommend Balzano’s in Cambridge for locals) – Sainsbury’s also carry a good, own-brand Italian sugo for a short period every summer. To make your own, just simmer whole tomatoes in a pan with a little butter, salt and sugar (no water) until the skins are bursting, then strain the lot through a sieve. Chop the aubergines into even dice. Heat a few tablespoons of olive oil in a large, thick-bottomed pan until it starts to give off its fragrance and tip the aubergines in. Fry, keeping everything on the move, until the aubergines are soft and turning brown. Remove them to a bowl. Dice the onions roughly and fry them in some more oil in the same pan until soft. Add the chopped celery heart and stalks, the pine nuts, capers, olives and sugo, and stir until the celery is tender – about five minutes. (Make sure you don’t add too much sugo; this should be moist, not wet.) Add the cooked aubergines and shredded basil to the pan and cook, stirring gently, for another ten minutes. Add the vinegar and sugar, cook for another five minutes to take the edge off the vinegar, and season with nutmeg, salt and pepper. Serve immediately or leave to cool. Mine is currently on the kitchen table, cooling for Fontina sandwiches later this evening. My stomach is growling. Bar Shu (28 Frith St, W1D 5LF, 020 7287 6688) is a Sichuan restaurant on the borders of London’s Chinatown. Sichuan food isn’t much represented in London’s restaurants; most of the Chinese food you’ll find here is Cantonese, with chefs from Hong Kong and a very different cuisine from that you’ll find in other parts of China. Although Sichuan food is rare in the UK, I’ve been to a few Sichuan restaurants in Malaysia, and was very excited to find one in London. The food is characterised by the heat of dried chillis and the sharp spicing of Sichuan peppercorns. I’d read several glowing reviews of Bar Shu, and decided that we’d go this weekend, after ticking another box on the ‘things to do before you die’ list and seeing the Bolshoi Ballet at Covent Garden. It was, as you can see, a grim, grim day for August; grey skies and torrential rain made me wish I’d brought a few jumpers. Nothing works better than eating a sack of chillis as big as your head to cure you of the weather-related blues. 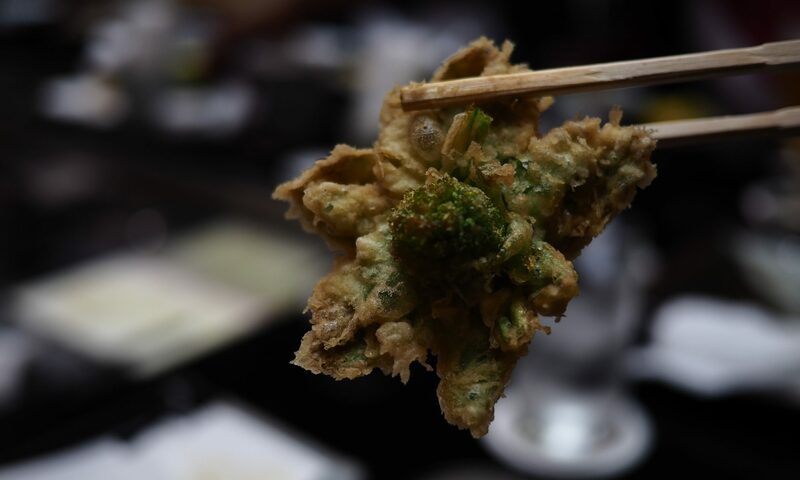 The menu at Bar Shu can be a little hard to navigate; it’s structured around photographs of the food. All the starters on offer are cold, although smaller starter-sized portions of street foods including Dan-Dan noodles and dumplings in chilli oil are to be found at the back of the menu. We started with Husband and Wife Offal, Smacked Cucumbers and the Numbing-tongue Dried Beef with Sichuan Peppercorns. The dish on the left is the glorious Husband and Wife Offal; it was made of feathery pieces of tripe and some other more muscly parts of the cow, all coated with a glossily red chilli oil scented with garlic, herbs and Sichuan peppercorns. Even my Mum, who doesn’t readily eat tripe, was fighting the rest of us for a piece. This chilli oil is curious stuff. It’s startlingly red, but not blow-your-head-off hot. It had a gorgeous warm intensity, and penetrated the offal with flavour. Smacked cucumbers (so-called because the cucumber is walloped with the flat of a cleaver to break it up a little and help it absorb the sauce) were delicious and simple. The cucumbers, raw, were annointed with a sweet garlic, sesame and soy concoction, and acted as a good foil for the heat of the other starter dishes. Fish dishes here are expensive, but we ordered a crab, which looked fantastic in the menu photograph. It was a lovely specimen, the shell packed tightly with creamy red roe, the legs full of clean white muscle. It was served in a dry style with more of that chilli oil, some whole garlic cloves, peanuts, spring onions, whole dried chillis, celery and bamboo shoots flown in from China. The spicing was positive and delicious; between four of us we sucked the carcass dry and licked the plates. Pock-marked Old Woman’s Beancurd was delicious as far as my Dad and I were concerned. Dr Weasel and my Mum, the two people at the table with no Chinese genetic tastebud material, both found it a bit sour, which I think may have been to do with the preserved vegetable in the sauce. Offal was represented with flair on the menu. This dish is Flower-exploded Kidneys; kidneys sliced like the squid you’ve seen in Chinese restaurants so they form into a pretty shape when cooked, then stir-fried at a blisteringly high temperature for a very short time. It was perfectly done. The kidneys had been well cleaned and soaked, so they smelled sweet and fresh, and they’d been cooked so briefly that there was no hint of chewiness. Cloud-ear fungus and cucumbers provided contrasting textures. Pork knuckle, braised until the meat flakes softly away from the bone to the touch of your chopstick, was served in a thick, sweet sauce positively glowing with chillis. It was a mistake positioning this in front of my Dad, who perked right up when it arrived, and somehow absorbed the whole thing into his person in one go while I was looking the other way. I responded by annexing the Fish-spiced Aubergines. We were full to the gills and starting to run late, so on hearing that the sesame paste-filled glutinous rice balls for dessert would take half an hour to prepare, we decided to call it a day. I think that another visit is in order; there’s acres of menu left to explore. Those interested in exploring some Sichuan recipes should order Fuchsia Dunlop’s Sichuan Cookery. Dunlop is a consultant for Bar Shu, and the book is excellent – both book and restaurant come with a hearty recommendation. My parents have just come back from Madeira, where they stayed at the Savoy hotel and were captivated by a tea blend which is specific to the hotel. It was a hot, hot day, and they were amazed to be as refreshed as they were by a pot of Darjeeling. Some vigorous questioning revealed that tea wasn’t the only thing that had gone into the pot. I’m not one for blended teas, and Earl Grey, Rose Pouchong and Lapsang Souchong (preferably from Taylors of Harrogate) are as far as I’m usually happy to venture into the land of flavoured teas. It took a bit of prodding from Mummy to get me to accept a cup from her precious stash – and my, I’m glad I did. The tea that forms the base of the Savoy blend isn’t any old tea; no sweepings from the floor of the tea factory for the Savoy. It’s a FTGFOP (First Tippy Growth, Flowery Orange Pekoe) Darjeeling; a pinkish and very fine tea. The Savoy transforms it into something quite wonderful with the bizarre-sounding addition of a small proportion of dried lemongrass, cinnamon, peppermint and hibiscus – it’s not overtly herby, but very refreshing, cooling and extremely delicious on a hot summer’s day. The hotel recommended that the tea should be drunk with milk and no sugar. Only one bag of the tea came back from Madeira, and while good Darjeeling is pretty easy to get your hands on, the herbs can be hard to find in the shops if you want to experiment with your own blend. Starchild International is a very good resource for buying dried plants and herbs online; try to look past the new-age quackery and be impressed that you’ve found somewhere to buy that powdered orris root you’ve been looking for all year. A quick and dirty recipe for gardeners with a glut of garlic and tomatoes. This pasta sauce makes the most of each ingredient – the garlic is roast for a sweet, fragrant mellow taste, and the tomatoes, fresh and juicy out of the garden. I am having unbelievable success this year with Tumbler tomatoes, which do very well in a pot. If you’re cooking this for guests, you may want to seed and peel the tomatoes, but we enjoy the tomatoes in this just chopped into chunks. I used angel hair pasta – use whatever’s in your cupboard. Roast the garlic whole with the thyme and oregano tucked around it, the butter and olive oil smeared and drizzled over it, for 40 minutes at 180° C. When the garlic comes out of the oven, set it aside to cool a little while you put the pasta on to cook and cut the tomatoes into large dice. Squeeze the soft cloves of garlic out of their hard skins into a serving bowl. If your garlic is very fresh, you can leave the skins in to nibble on too. Mine was straight out of the ground, so the skins went into the bowl. Tear the basil roughly and put it in the bowl along with the herbs, butter and oil from the garlic dish and the tomatoes. Season with salt and pepper, and put the steaming hot pasta on top of everything. Mix gently and serve immediately. I needed to restock my storecupboard this weekend, so we headed for Oriental City (see my earlier post on Oriental City’s food court for directions). It’s probably my favourite source for exotic ingredients, as the supermarket extends to cover Korean, Vietnamese, Japanese, Malaysian and Thai ingredients alongside the Chinese bits and bobs you’ll find in many other oriental supermarkets, and has a remarkably good selection of fresh produce flown directly from Asia. They’re currently reorganising the supermarket to extend the Japanese section, which has a grand re-opening later in August. All of the shelves are clearly labelled in English so those with problems reading Japanese, Chinese, Thai and Korean orthography do not accidentally buy tinned silk worms (something I have still not been able to bring myself to sample). The supermarket is also an absolute joy for fresh ingredients; the pictures below are just a small selection of the fresh goods on offer. Six different kinds of chilli. There were more on another shelf, and a further shelf of dried chillis further back in the supermarket. Turmeric, young ginger, galangal and other juicy, fresh roots for pounding into pastes. Six different kinds of small aubergine. I used the purple ones towards the right in a Thai green chicken curry yesterday. The fresh fruits, spices and vegetables extend all the way down one wall. You’ll find Asiatic pennywort, pandang leaves, banana leaves, lily buds, gourds, mooli, a million and one variations on the theme of a cucumber, perilla, lotus roots, herbs like Mitsuba…it’s a challenge to recognise everything. While many places will only stock one kind of soya sauce or one kind of fish sauce, this supermarket prides itself on the choice it offers. I counted six kinds of fish sauce, and one side of an entire aisle is given over to different soya sauces. The chilli sauce aisle is packed tightly on both sides with bottle upon bottle of the red stuff, and there were seven different brands of instant dashi, alongside the bonito flakes and kelp you need to make your own. Ex-pats craving snacks from home are well catered for. These Japanese snacks are on offer at the moment so they’re out of the way before the advent of the new Japanese section, which will, apparently, carry even more. Here’s that crab again, with some other fish so you can get an idea of scale. The fish counter is one of the fewI’ve found that will actually carry fresh, properly prepared fish specifically for making sushi and sashimi at home. (It’s also a good place to find roes like tobiko and a fresh salmon roe.) Cuts of meat which aren’t usually represented in UK butchers are also easy to find here; chicken’s feet come frozen or fresh, and there are even duck tongues for the brave. If you live in or near London, or if you’re just passing through, try to pay a visit to Edgware and see what you can find at the supermarket. Cook with something you’ve never tried before. Try to find out which is the strongest chilli. Use those canned silkworm larvae to broaden your experience. I’d love to find out how it goes.